Nothing says caveman (or cave-woman) quite like a meal of meat and potatoes. 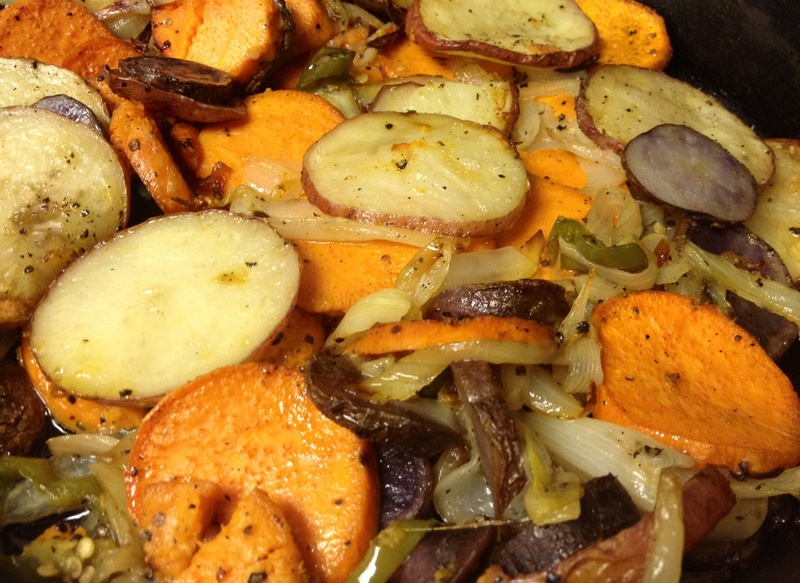 I like to make these roasted onions and potatoes with a medley of different potatoes, and sometimes with just sweet potatoes. Either way it pairs perfectly with any grilled meat, but my favorite is steak. Trust me when I tell you these are some tasty taters! 1. Slice all of your potatoes into circle slices, slice onion into slivers (not too thin, don’t want them to burn), and jalapeno into slices. Place these in a cast iron skillet (or baking dish if you don’t have one) and drizzle with olive oil. 2. Season liberally with salt and pepper and stir them all around making sure olive oil and seasoning is well distributed. Top with 1/2 butter cut into slices and bake in 375 oven for approximately 1 hour. These were really great! Going to make them for Xmas party next week!